This serves as an addendum to the previous post, but I thought it was worthy of attention in its own right. 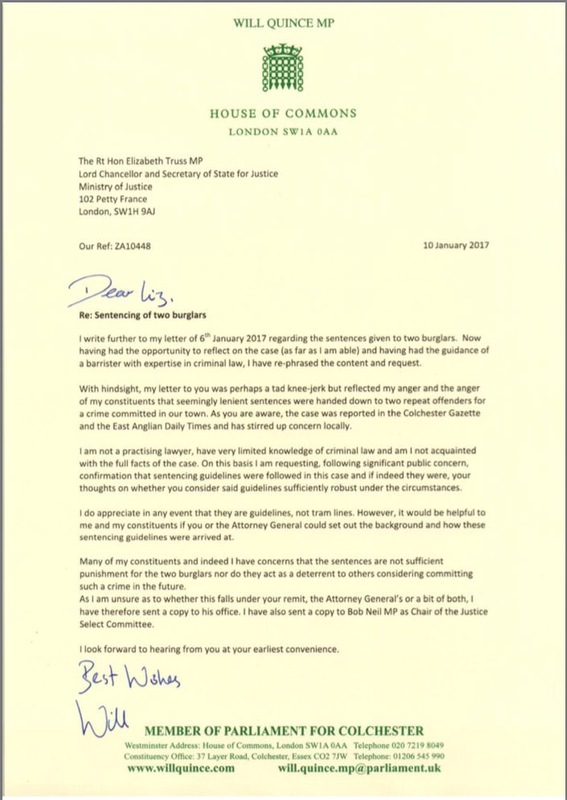 To those who missed it, a brief recap: Will Quince, MP for Colchester, publicised a letter he had sent to the Lord Chancellor, in which he expressed his view that a sentence passed in a local Crown Court on two burglars was unduly lenient, and invited the LC to agree. I took umbrage at the fact that this settled criticism had been formulated without knowledge of the full facts of the case, nor any acknowledgment of Sentencing Guidelines that judges are required to follow, and wrote a fairly impolite and intemperate rejoinder. The letter speaks for itself. And, if he will forgive me saying so, it also says much positive about Mr Quince. Although (for the reasons expressed in the last post) it appears to me that the Sentencing Guidelines were properly applied in this case – and that a comment from the Lord Chancellor on a specific case is unlikely – I obviously cannot and do not take issue with him posing the question and seeking further information. It is similarly entirely proper for him to reflect the concerns of his constituents and to ask whether the Sentencing Guidelines, as presently drafted, command public support. He is not alone in his concern that Sentencing Guidelines sometimes betray inconsistencies and appear out of kilter with public expectations; many in the professions would agree. For completeness, I would add that the links to the public consultation exercise that informed the Burglary Guidelines can be found here (with an explanation of the role and functions of the Sentencing Council here). It is rare for a public figure, when challenged or corrected on the way they have represented the law, to admit an error or a rush to judgment. It is even rarer for them to take steps to publicly adjust their position. It is to Mr Quince’s enormous credit that he has done so with such speed and candour, not least given that I did not initially engage him in particularly cordial terms. For that, I again apologise. It is too easy to assume that all MPs who opine misleadingly on the law do so with the chronic, wilful ignorance and boastful obstinance of Philip Davies, rather than to countenance the possibility that this is a human being making a mistake in good faith. I am grateful to Mr Quince for, through his conduct over the last few days, reminding me of this. This entry was posted in Contemplations, Judiciary, Lawsplaining, Politics, Sentencing and tagged Burglary, Courts, Crime, Sentence, Will Quince MP. Bookmark the permalink. ← A court soft on burglars, or an MP missing the facts? This leaves me with a renewed sense of hope about the benefits of free speech in a free society. This has been episode that reflects well on all concerned, and a timely reminder that we all have much to learn from each other. Thank you for keeping us up-to-the-minute. You never know, this could be the beginning of a beautiful friendship. Congratulations to you both for impeccable good manners. Please don’t stop being impolite and intemperate though. Seconded. Both you and Mr Q come out of this well. But I’m saddened to see that one of the grounds for Quince’s concern – even in this more moderately-phrased form – is the perception that the sentences were insufficient to serve as a deterrent. I’m not a lawyer but I am a criminologist, and it’s well-attested in criminological research that sentence lengths – and, in particular, changes to sentence length – don’t deter. (And, after all, what would the chain of reasoning have to be? “Wait a second – I hear that I could now be facing a five-year stretch if caught and convicted, and not the wrist-slap of a thirty-month term which threatened me until recently! It makes you think and no mistake. I shall give up my life of crime forthwith and earn the cash to feed my drug habit by the sweat of my brow, so ‘elp me.”) It’s a very common error, to be fair, but a costly one, as it feeds into the tendency for sentences to ratchet ever upwards. It would be nice to think the Lord Chancellor would put him right. It is indeed a very good reflection and unusual,on the MP, though the initial response by the Secret Barrister though a trifle sharp was accurate in its legal frame. I think we have had enough of mob rule whether by Referendum or Red Top for a little while.